Odisha Phase-III Admission in Junior (+2) Colleges 2017-18 Online Apply & Dates. DHE Odisha Phase-III +2 Junior College E-Admission Notification 2017-18. 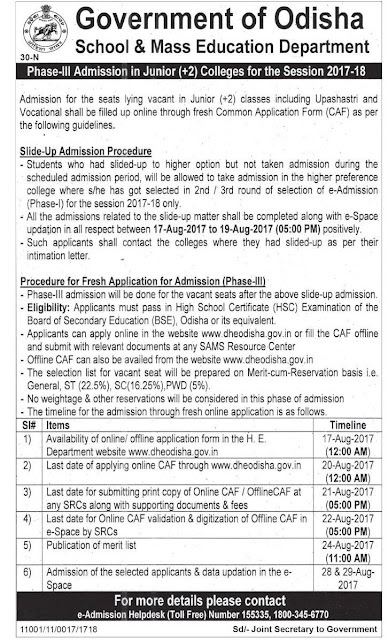 Department Of Higher Education (DHE) Government Of Odisha Published Admission Notification for Phase-III +2 Junior College Admission Notification for the Session 2017-18. Eligibility- Candidates Must Have Passed 10th Class HSC From BSE Odisha Or its Equivalent. Publication Of Merit List – 24 August 2017.